Regime Superman trades blows, while Wonder Woman contends with Harley Quinn and Batwoman. All the while Batgirl contends with Killer Croc in an effort to free Catwoman. Batgirl is able to give a "green pill" to Catwoman, and once done with Croc, they alert Batman, who escapes with his Insurgency, using a lead-based smoke bomb to vanish before Regime Superman's eyes. Batman believes he needs to have the people of the world on the Insurgency's side, but Catwoman, after being tortured, now realizes that Batman cannot win the fight against Regime Superman, and leaves. 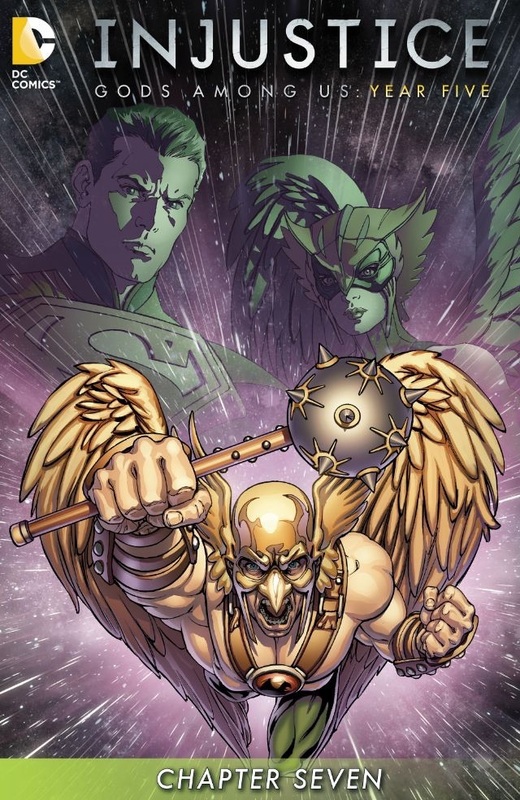 On Thanagar, Hawkman inquires as to Hawkgirl's whereabouts. When he learns she's on Earth, he leaves enraged, and departs full-speed for the Hall of Justice. Story - 1: The complacency of the battles is banal beyond compare. Regime Superman and Wonder Woman, against Batman, Harley Quinn, and Batwoman... is the outcome ever in doubt? Not a thing happens that wasn't predicted previously, but the problem isn't with the escape, but with the wooden approach of the fights that must take place. Batman and Regime fight toe-to-toe, for no apparent reason other than it suits Batman. No super-speed, no heat-vision, super-breath, just a leaden punch/block/punch/block until Batman decides to escape using a smoke bomb. A smoke bomb. Regime can see across the electro-magnetic spectrum, and Batman escapes with a smoke bomb. Regime can hear a tick praying in Okinawa, but Batman escapes with a smoke bomb. Regime Superman can emit gale force winds with his super-breath, and Batman escapes with a smoke bomb. Readers are asked to induce stupidity for the act, as the smoke bomb is "lead-based". Every primary school student knows the phrase: "Heavy as lead." Lead isn't going to rise above, and neither is this nonsense. "Stay down! If I wanted it, you'd be dead already!" Sound familiar. That has been the meme used to placate readers since 1986. Superman can end the fight anytime he wants. He doesn't want to hurt Batman. Only, Batman has no such compunctions, and has been Bugs Bunny to Superman's Yosemite Sam for over 30 years now. Regime Superman should be different. He's not playing games; he'll do whatever it takes to get the job done... except kill the Batman. The problem that's dogged Superman with Batman encounters, is that he's never needed to kill Batman to stop him. Superman could easily stop Batman, and end the encounter safely for both of them. However, he's made to be the overconfident Hare, while Batman slow and steadily chips away at his lead. Regime Superman was different. He stopped Batman. He broke Batman. He wasn't to be trifled with. What happened?! He's as pathetic as any super-villain, you're almost expecting him to narrate how he's going to kill someone. Eventually readers will stop accepting what is said, that Superman can end the fight at anytime, and simply ask: "Why don't you?" Art - 3: The line work is serviceable enough, but as it's illustrating the miasma of a trite story, it's brought that much lower.